Warnfried Altmann, saxophone; Hans Guenther Wauer, organ. 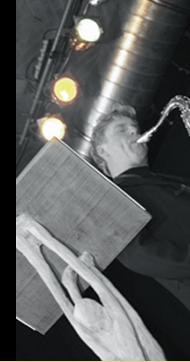 Joerg Dathe, speech/vocals; Three Countries Quartet: Hans Christoph Winckel, double bass; Peter Koch, cello; Warnfried Altmann, tenor saxophone; Bernd Born, baritone saxophone and clarinet. Friedrich Schorlemmer, speech; Warnfried Altmann, saxophone; Prof. Hans Guenther Wauer, organ; Hermann Naehring, percussion. Warnfried Safi Sana Altmann, saxophone; Ndahani Bwani Zawose, thumb piano, seze, vocals and drums; Cassius Mlewa Maganga, marimba, drums and vocals; Amiri Rajabu Mkufya, marimba, drums, vocals and dance. With a booklet text by Bert Noglik. Hermann Naehring, percussion, marimba; Warnfried Altmann, tenor saxophone; Albrecht Riermeier, percussions, drum set, vibes.